I have a friend who looks back over years and years worth of journals every year on New Year’s eve or day – looking back to smile – and sigh – that the more things change, sometimes, the more they stay the same. I have several journals that I move between, and my sketching journals amuse me the most because I can see that same pattern. Years ago, I was worrying about finishing this deadline, making sure that that story was just right, wondering if I’d ever attain this thing I wanted. I understand now more than ever that I am luckier than I believed. O, Clive, how we adore you. We shall embrace our toads and diamonds, our chicken-legged houses, our red-hot dancing slippers and our wicked witches with joy. A flourish of the fedora and a click of the heels to Laini Taylor‘s very childlike blog for today’s quote. It’s been a week for lists. Several weeks ago, I found I was being nominated to the 2013 Rainbow List, which is put out by the Social Responsibilities Roundtable of the American Library Association. The Rainbow celebrates books which positively portray LGBTQ characters. A wee bow to the ALA Rainbow jury – thank you for including HAPPY FAMILIES in such august company. Another tip of le chapeau to Suite 101, whose list of 10 Great YA Novels With Strong Characters lists MARE’S WAR at #7. Thanks, guys! 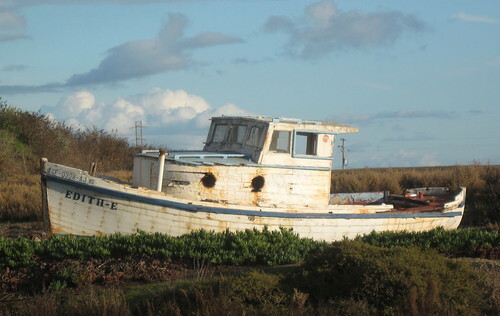 Tanita, your photo of the boat evokes an I-don’t-know-what. I suppose je ne sais quoi is the appropriate phrase, but I’m feeling Saxon-rebellious these days. I appreciate the dignified boat run aground. And nothing wrong with being, instead of doing, doing, doing, doing. your thought on there being purpose and beauty in running aground is one that I think more people in our “I must succeed and be the best etc” society would do well to keep in mind….I was deeply annoyed by a little display in my public library the other day–the elementary schools want a new slogan, and we were asked to vote. All the choice were variations on pride, and success, and being best…I wanted something to vote for that was more along the lines of “humble learners today, lifetime learners tomorrow.” Because there is nothing wrong in not always being the ship out at sea, bringing in the best catch of fish. Congrats on making those lists 🙂 ! “I like the idea that there is no futility in no longer being fit to do what you did once; that there is still beauty and purpose to be found in running aground” = thank you. Phew.